Wall graphics are temporary graphics intended for short to medium term messages. Wall graphics are removable and are commonly applied to painted drywall surfaces in offices and retail locations. Wall graphics can be removed without damaging paint or wallpaper and some may require the ability to be repositioned after initial placement. 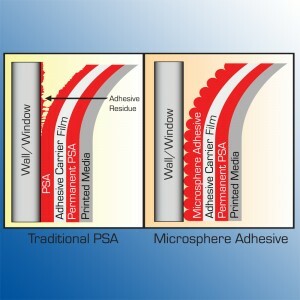 D&K recommends using a repositionable microsphere adhesive that allows graphics to be repositioned up to 10 times without damaging walls or leaving behind adhesive residue.